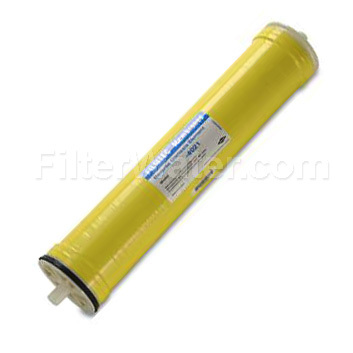 DOW Filmtec TW30HP-4611 RO Membrane 1200 GPD, a 4.6" x 11" Reverse Osmosis Membrane that can provide RO quality water up to 1200 gallons per day. It can operate at feed pressures ranging from 225 psi to 600 psi with 99% salt rejection. This element is a 4.6 inches in diameter which features highest quality of membranes available on the market today for Hospitals, Dialysis, Clinics and other Medical Applications. The high performance TW30HP element is designed for high performance and salt rejection. Made with the same high quality material as Filmtec commercial and industrial membranes. This membrane is a part of the "Tape-Wrapped 46NN Elements for Medical Applications" by DOW FILMTEC , including TW30HP-4611, TW30HP-4619 and TW30HP-4641 , and are applied in water treatment systems for medical and research institutions. Its advanced technological design is manufactured for excellent structural stability and more productivity than other elements. Dimensions(Diameter x Length): 4.6" x 11"